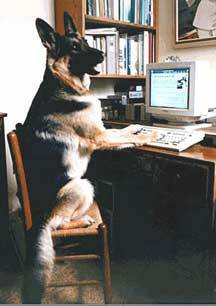 February 2008: Total German Shepherd Newsletter - Want to learn more about the German Shepherd Dog? Read on, here is the best German Shepherd Dog information available on the web, and all in one place, just for you and your German Shepherd. Help support our site by making a purchase from us if you are in the market for German Shepherd related items. We have a wide range of products from the finest of dog collectibles to things you use everyday, like regular checks, and everything in between. Thanks for browsing. For more info, contact us at our contact form on our website at any time, or you can send them to us directly at "gsdphotos (AT) rock DOT com" .